Hello there. 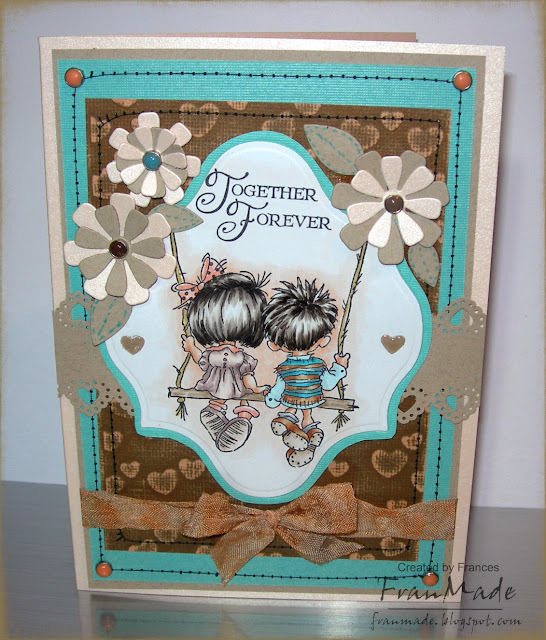 Here's the card I made for my hubby so no pinks and reds although it's still a bit too girly probably, but he didn't seem to mind! The gorgeous image is one of many LOTV stamps that I have in my collection now as I just adore them. Just need to find the time to use them all. So this is a start. The sentiment came with it and I didn't seperate them out but may do at a later date. Coloured with Copics and I gave them a peacy glow around them like they are looking into the sunset. The hearts embossing folder is a country companion one I happened to see and I have used piece of Coredination cardstock and sanded down. Bit of stitching with the sewing machine (before I realised the tension was wrong so don't look too closely), MS heart border punch, nestie die, and the flowers are one of the fab MFT dienamics die (again I am loving their dies and am slowly building up my collection. Still love my MS punches but the dies take up less space and I can cut out more than just card like felt etc which is fab). Only embellies used are some brads and some seam ribbon I have dyed to match my card using distress inks. I hope you are all well and being crafty. I do occasionally still blog hop and have a quick squizz at what you are all up to - I just haven't been commenting. Less blog hopping has helped me avoid too much tempation of wanting new stash though not stamped it out completely (LOL . . no pun intended). 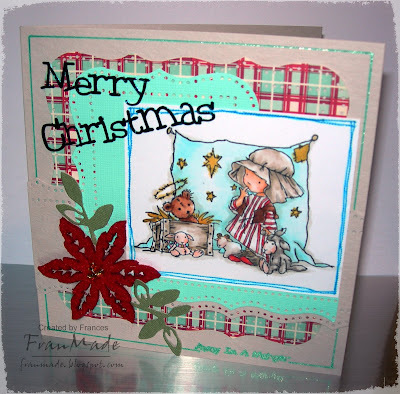 The only other card I have made is this christmas card (going to build them up slowly for next year) which is again using another LOTV cutie and the fab 'cherish' MS punch set was christmas pressie from hubby. The gorgeous leaves are a WOJ die which I have cut into 2. This one is a bit simple but find I need flatish ones to fit in the post easier. Until next time, have a wonderful day whatever you are up to.